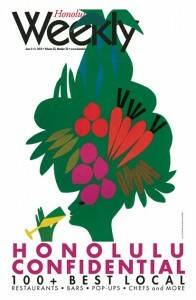 The new edition of the Honolulu Weekly includes a feature on the food forest project. Here are a few excerpts. In addition to planting food in public spaces, Food Forest is “also about rethinking the way we allocate our resources towards stewardship of the ‘aina, in a way that is respectful to all and ultimately builds stronger communities,” says Matthew Lynch, executive director of [Asia-Pacific Center for Regenerative Design]. “We applaud the revitalization and restoration of Kamalii Park to benefit the community and the environment and we encourage other communities to do the same,” says Alvin Au, chair of the Downtown Neighborhood Board. This entry was posted in Food Forest, Media. Bookmark the permalink. Post a comment or leave a trackback: Trackback URL.